Damien Crutcher is a native Detroiter and a graduate of Cass Technical High School. 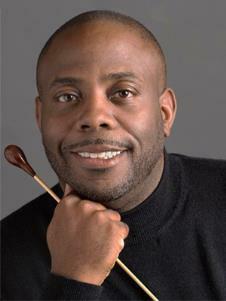 He holds a Bachelor's Degree in Music Education from Michigan State University, and a Master’s in Conducting from The University of Michigan. He is currently the conductor of the Farmington Community Band and the Detroit Symphony Orchestra’s Detroit Community Concert Band. Damien is the the co founder and CEO of Crescendo Detroit. Crescendo Detroit is a nonprofit who’s mission is to transform the lives of school age children, ages 5-18, in Detroit, by engaging kids in intense instrumental music, vocal music and dance programs that promote artistic excellence and character building. It is the goal of Crescendo Detroit to create a neighborhood to college pipeline using the arts.